Quality Plan assuring the proper management and efficient project progression and workflow. This deliverable is the public version of the final report on the activities and results of the project. It will be available from November 2020. A public version of Final Report on the activities and results of the whole project will be available from January 2021. Report on the outcomes of communication, dissemination activities as well as community building and stakeholders consultation. This deliverable provides recommendations, tools, procedures and common protocols to be validated in the experimental pilots. It will be available from May 2018. This deliverable contributes to the creation of a cross-disciplinary and international network of relevant heritage scholarship, focusing on minorities, rural landscapes, small towns, Cultural Heritage institutions, with the aim to establish new interconnections in a rather fragmentary field. This deliverable reports about internal and external evaluation conducted along the whole project. This deliverable describes the planning of the workshops and the assessment criteria for their evaluation. It also provides detailed and operational protocols to be followed in the thematic workshops, to guarantee their alignment and interconnection. Aggregated report about the thematic workshops held in Berlin, Coventry and Granada. It will provide: summary of the topics addressed, description of participants, analysis of users’ feedbacks on the participatory experience, lessons learnt, recommendations and best practices. It will be available from February 2020. This deliverable provides the analysis of good practices and suggestions for the final version of the “REACH proposal for a resilient European Culture Heritage”. A report on the outcomes of the final conference, number and categories of attendees, level of participants’ interest and interaction, and final deliberations. This deliverable reports the outcomes of the local encounters, aggregating requirements emerged from the participating users, barriers, policy frameworks, and any other input useful to be transferred to the pilots and to the other Work Pakeges. This deliverable includes working papers and best practice guides. Lessons learnt from the pilot case studies will be organized in two transversal categories: the first analysing the case studies from social aspects and the second considering the cultural rights and perspectives of these encounters in the light of adoption of participatory approaches. 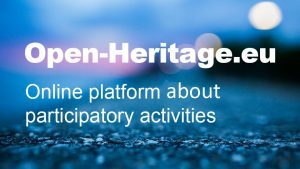 Report on the activities of the Institutional Heritage Pilot . The outcomes will be the base for practical guidelines addressed to Cultural Heritage Institutions. This deliverable consists in a report and a video about the adoption of REACH participatory models for building dialogue and consensus for Cultural Heritage preservation in rural areas. This deliverable provides a critical review of the results of the desk study and encounters carried out with local actors, with particular focus on resilience of small towns. This will provide a framework for sharing knowledge and analysis from academic partners, experience and other inputs from locally involved stakeholders, and a matrix of good practices from other countries in the form of a participative interactive map. This deliverable summarises and compares the findings from methodologies, methods, algorithms, data collections, data structures, and visualisation techniques from previous projects. internal draft containing suggestions and recommendations for workshops and pilots, in particular about data gathering from participatory activities. updated during the delivery of project’s activities. Final release of the deliverable, reporting data gathered during the whole project. Based on all results from the previous tasks and deliverables. It will be available from May 2020. This deliverable provides a description of the steps to foster the evolution of participatory approaches in the preservation, use/re-use and management of Culture Heritage, aiming at improving Culture Heritage resilience and to generate social innovation. In particular, the deliverable highlights the role of participatory approaches in supporting social cohesion and integration in Europe. A first version of the document will be produced at month 24, discussed at workshop in Prague, and then updated in successive versions, through an iterative process. Final delivery will be available from november 2020. This deliverable illustrates the plan agreed among the partners and the associate partners for the sustainability of the social platform at the end of the EC funded project and it is complemented by a critical collection of best and bad practices.